Our Chester Pest Control Exterminator will identify the source of the pest infestation & create a customized treatment plan to eliminate the pests. 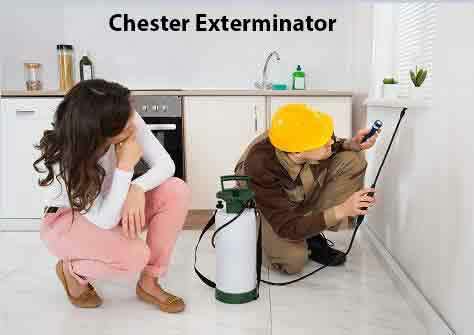 Let us be your Chester Exterminator, Give Us A Call Today. 1-844-305-8999. Not only are Ticks a nuisance but they are a public health problem as well. The three most common ticks in Chester NY are the deer tick, the American dog tick and the lone star tick. Only deer ticks can carry the bacterium that causes Lyme disease. Just over half of adult deer ticks collected in New York State carried the bacteria that causes Lyme Disease. Black-legged ticks, also known as deer ticks, carry seven different diseases, including the most common, Lyme disease. People who live in areas surrounded by tall grassy areas or woods have a higher risk for Deer Tick bites. If you notice you have a Tick Infestation on your property, Give Us A Call. We have Quarterly and Annual Tick Treatment Plans Available. Carpenter Ants are destructive pests of wood and are commonly found throughout New York State. Carpenter Ants are about a half inch long. They prefer to burrow in damp wood but have also been known to damage solid wood. They do not eat the wood, but simply remove it to build a nest. The damage to your Home or property starts out small but as the number of individuals inside a colony grows the damage becomes much more extensive. If you notice you have a Carpenter Ant Infestation or would like to have an inspection, Give Our Chester Exterminator A Call Today. We Specialize in the removal of Carpenter Ants. There are thirty nine unique species of spiders found in New York. Spiders are generally good to have around, as they help minimize the population of harmful insects. The problem arises, however, when they negatively affect humans, even the thought of having a spider or a Spider Infestation in your home can be very scary. If you have spiders on your property or in your home that you would like removed, Give Us A Call Today. Our Technicians are specially trained to handle and remove the spiders from your home.